These molluscs come big and fresh in Sekinchan. BEING a sucker for raw oysters, I was thrilled to hear that we could get fresh oysters in our backyard. Not one who knew about oyster species, I decided to check it out anyway in Sekinchan recently. At Station 15 in Bagan Sekinchan (bagan means fishing village in Bahasa Malaysia) where the oysters were served, I was greeted by Loo Lee Chuan, or Ah Chuan, as he?s known, at his makeshift eatery. 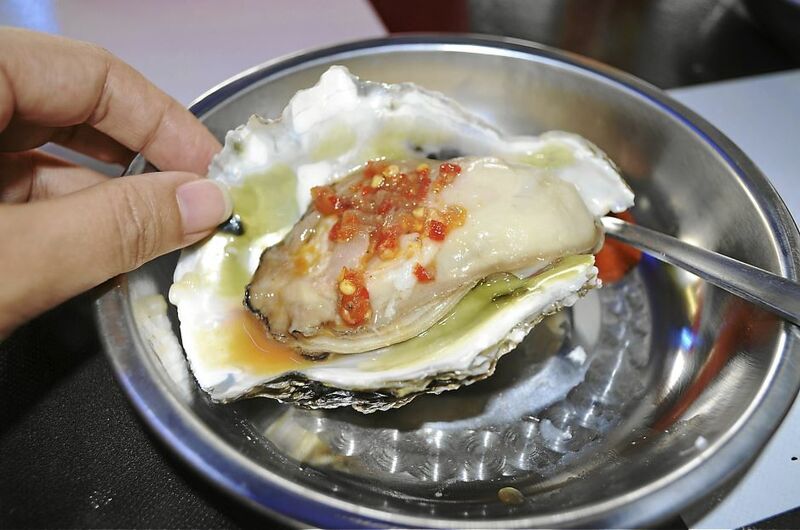 Ah Chuan, 43, said that people knew Station 15 as the only place that currently offers raw oysters in Sekinchan. The oyster feasting den fronts a pier where fishing boats dock. As half-naked men went about finishing their work for the day, Ah Chuan tapped on an oyster shell before prising it open. It was meaty. He then washed it under running tap water and served it with lime and a homemade chilli dip. Ah Chuan said that workers would go in small boats to rocky sites with an axe to harvest oysters. ?They can only collect the oysters during low tide,? he said, adding that harvesting could only be done 14 days a month and workers could reap around 3,000 oysters during that time. The oysters were supplied by his fishermen friends and would be served within the day. ?The biggest oyster that fishermen here have come across weighed 3kg,? said Ah Chuan. A normal-sized oyster weighs around 200g, which is considered small, while a medium one weighs 400g to 500g, he said. It takes four months for an oyster to grow to 200g, while the big ones are more than a year old. The small oysters are priced from RM3 to RM6. Ah Chuan served me one the size of half my fist, which was double or triple the size of the imported oysters I had eaten before. I had never seen one that big for consumption. As I scooped the oyster into my mouth and bit into it, one portion of it felt luscious like abalone mushroom while another part was a combination of sorts ? it had a seductive cheesy cream texture with a tinge of bitter, tangy and fresh sea flavour. Ah Chuan, a fruit seller, said he started offering raw oysters and seafood dishes 11 months ago. For my dinner, he had also whipped up big prawns fried with black sauce, curry crabs (kum heong) and lala mee sua soup. For me, the best way to enjoy the sweetness of fresh seafood was to eat it raw, as with the oysters, while the other items could either be boiled or stir-fried with a little seasoning. Ah Chuan?s dishes met my needs. The flavour of the noodle soup was unusual and it took me a while to appreciate it. It was sour and a little salty, and reminded me of a balsamic vinegar dressing in salads. Ah Chuan said that he had chosen the best mee sua he could find and it was from Rawang. ?The mee sua doesn?t expand and become soggy,? he said, adding that the noodles were already salted, so there was no need to add any salt. This was also the first time I had seen lala on the shell compared to the often shrunken ones served in the city, which was a sign that they had been frozen for sometime. The meal for two came up to a decent RM40, a price that I would certainly not find in Kuala Lumpur. Ah Chuan said that people should call before coming to the restaurant to ensure there was enough fresh supply of seafood. ?I want people to take their time and enjoy the best here.? Besides the dishes, Ah Chuan also sells prawn crackers which he fries himself. Ah Chuan gives out his business card and said people could treat it as a ?membership? card to his outlet. He also distributes the cards at Pantai Redang where he sells fruits. In recent years, Sekinchan has been noticed as a holiday destination offering fishing villages, padi fields and bird watching as its attractions. Sekinchan state assemblyman Ng Suee Lim has taken a personal interest in promoting tourism there and in the last five years, tourist numbers have increased. Restaurants have sprouted up and busloads of tourists have been arriving in the small town. Ng said that he had also prepared a booklet on Sekinchan.